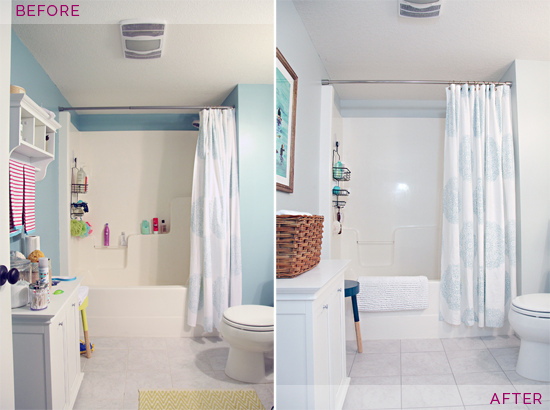 I couldn't be more excited about the change I made to our Master Bathroom space this week. It is the end of week three of the four week "Wait No More Challenge! 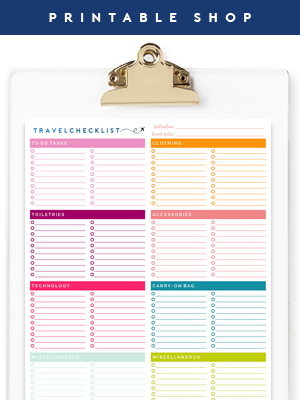 ", and I have been checking off some major "to do's" from our list. In fact, each week our lives have gotten better and happier as I tackle the major home-front pains we have been feeling. OK, not a cool mom move. Majority of the mess was mine, his bathroom belongings were a minimal part of the problem. 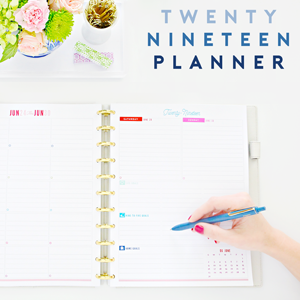 You can read about the planning process here. I started by removing everything not affixed to the floor, and even gave the room a fresh coat of paint to tone things down a bit. The update to the paint color made SUCH a fabulous difference. The entire room felt twice as big and so much more spa like. The next step was to address the dirty grout, a little Grout Renew made another big difference. 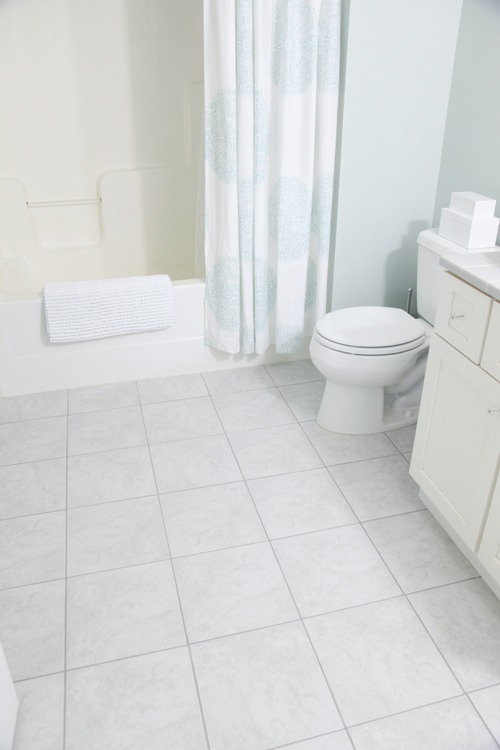 Although I really wanted to freshen up this space and prolong a down-the-road bathroom renovation, I didn't want to spend a fortune. 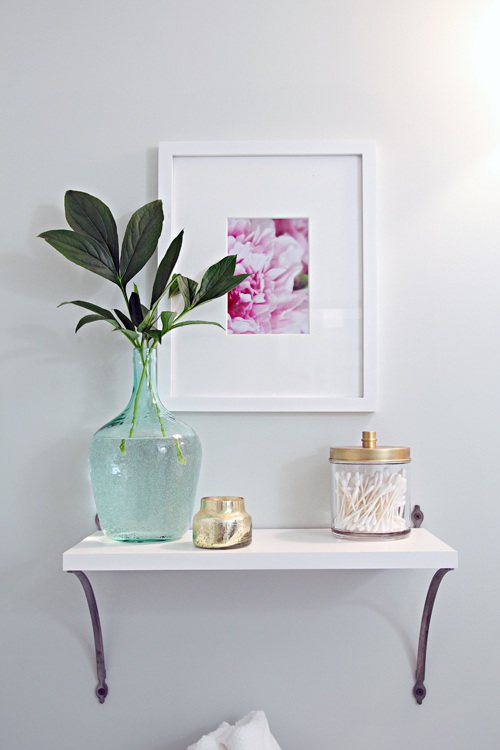 I purchased two new shelf brackets, two storage boxes and two glass canisters. The rest of the changes came as a result of shopping our home and doing a major decluttering and organizing session. Hello beautiful new-old bathroom! Such a difference a day makes! A reader asked what I do with old decor as I switch things around, I will cover all of those details in a future post, but look at the benefit of getting creative with things you already have. The mirror was in our Master Bedroom, but I feel like it was always meant to be here. I couldn't be more smitten about the natural wood paired with the new wall color. Sure, it will drive a game of musical mirrors, but a little change is a good thing. The previous wall shelf was so shallow, it couldn't hold most of our main bathroom items. After I purged everything down, I realized I didn't really need it at all any longer. 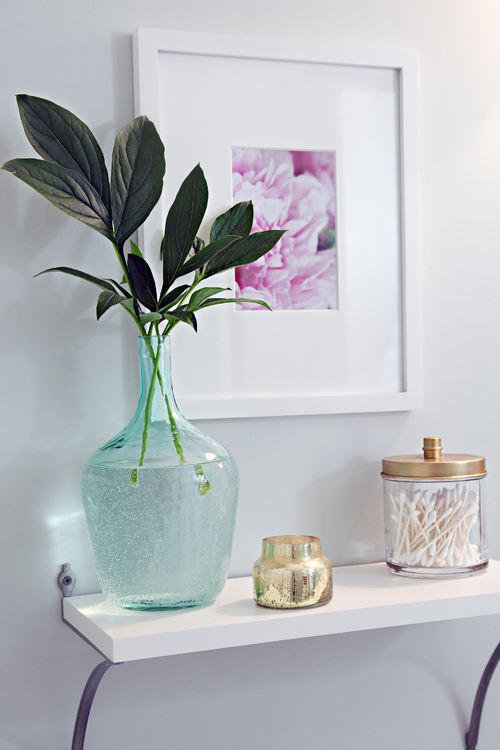 But I did want to fill the space above the toilet with a place for greens, a candle and cotton swabs. I purchased two new gorgeous shelf brackets and for the shelf we cut down a piece of wood we already had. 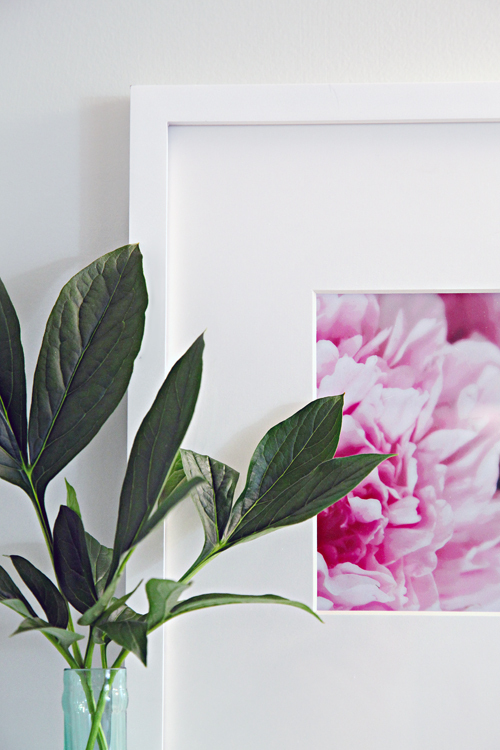 I dug out a spare frame and printed one of my own photos to use as inexpensive art. The photo is of a peony in our backyard, the greens are from the same peony bush. I did purchase two canisters from Target to use for cotton products. I had my eyes on these, but didn't want to shell out the extra cash just to have gold lids. So the ones from Target received a coat of spray paint paired with some gold Rub-n-Buff for a similar effect. After I was able to relocate many of the bathroom items back to their proper homes, I found that I had plenty of room to put everything else back (children's items were put back in their bathroom, travel toiletries were moved to our closet pile and other random items were also put away). 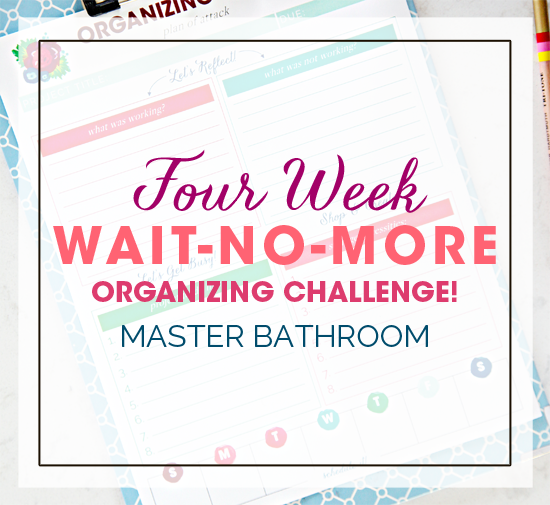 This time, I made sure to really assess how we use the bathroom and put things away according to our daily habits. Here is a quick tour of each cabinet and drawer. 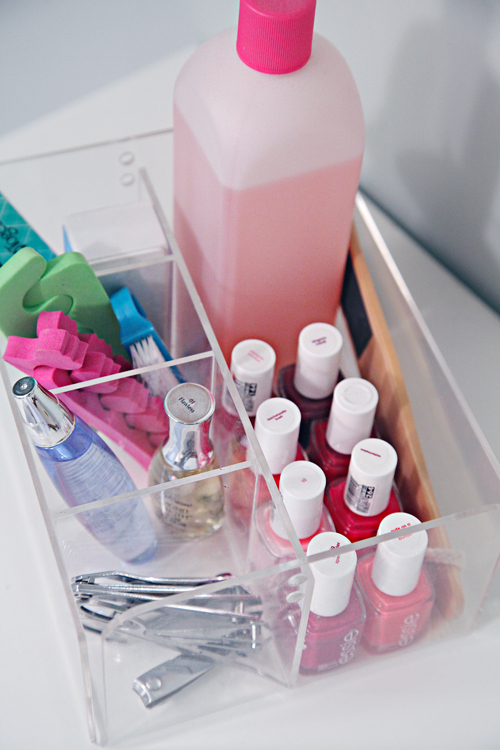 I have been using a nail caddy for years now, and still love it. It just received a quick cleaning and a little re-arranging and it went right back where it was living. I lost the hardware for the handle somewhere along the way. 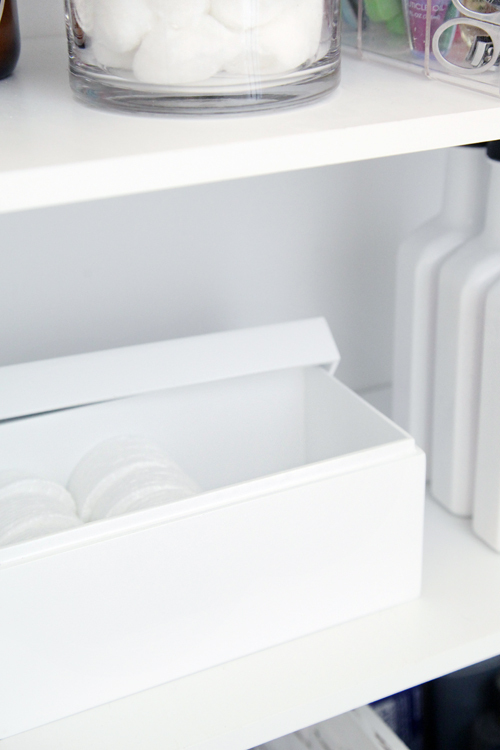 Quick tip: When displaying daily toiletries in glass faced cabinets or inside of acrylic organizers, simply remove any package labeling that may be distracting. The nail polish removal bottle now looks more decorative than it did when the giant label was showing through. As I mentioned, I ended up purchasing two decorative storage boxes. One holds cotton pads for face washing and nail polish removal. While the other is now the home to my hair accessories. 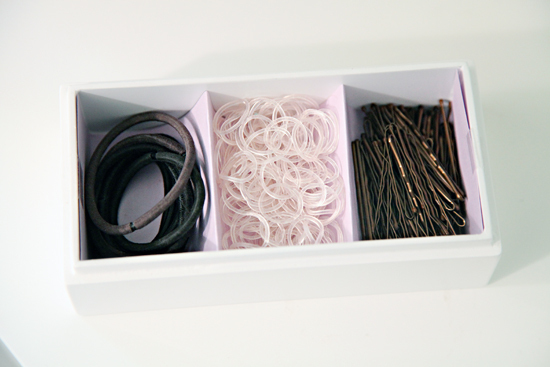 The small box paired with some folded cardstock for dividers, now keeps each type of hair accessory nicely divided, yet easy to take out and put away. Our original "His" and "Hers" baskets were working out nicely, but they were short and added to the visual clutter inside of the cabinet. 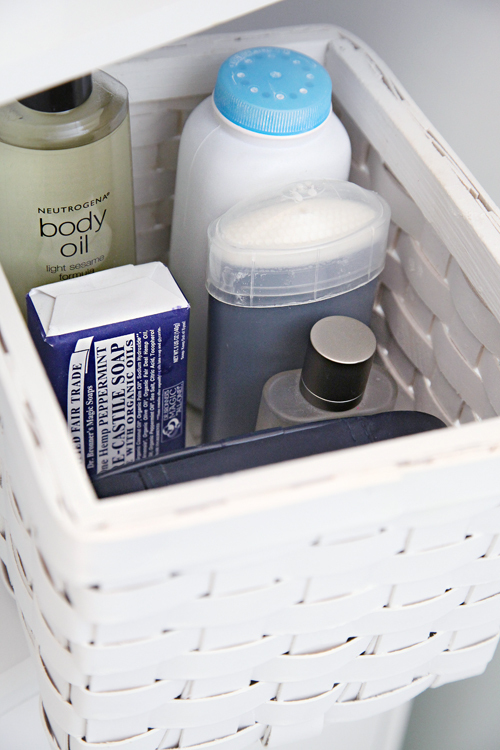 They both were pared down to daily necessities, and Bryan's items now live in a taller basket inside of the cabinet (so when he tosses items back inside, the mess won't be visible). My daily supplies now live in a bin hanging on the back of our door. I had multiple miscellaneous canisters of bath salts, which I condensed down to a single jar. I used one of the empty containers to now hold our dental floss. The drawers received a good scrub and were still showing signs of wear, so I got out some drawer liner and cut a few sheets down to size. This time around, I assigned each drawer a specific duty. 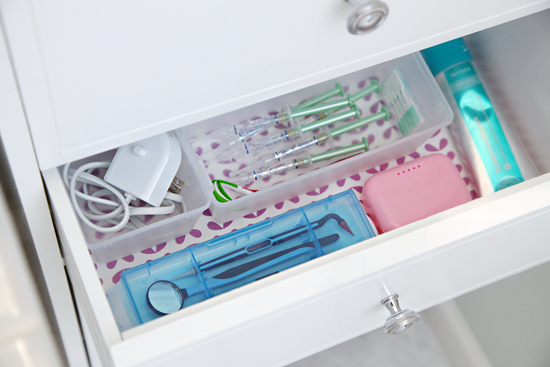 Top drawer holds all of my facial care supplies. 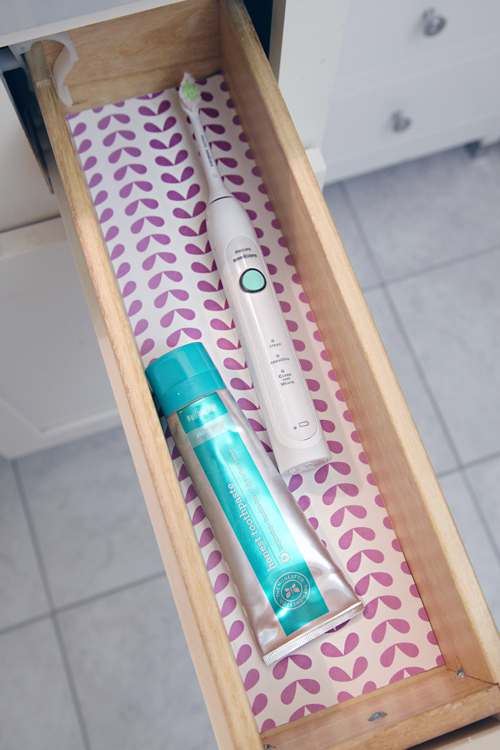 While the next drawer now holds extra dental care items. And the bottom drawer still rocks as hair tool storage (placed inside of empty quart sized paint cans). Now the only items in each vanity drawer are a single toothbrush and tube of toothpaste. 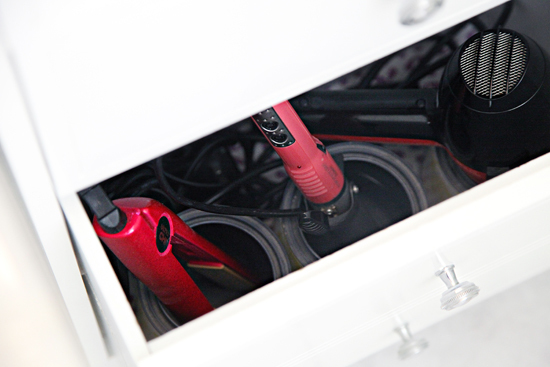 Under the sink is similar to prior days, one pull out drawer holds all of our bathroom cleaning products. 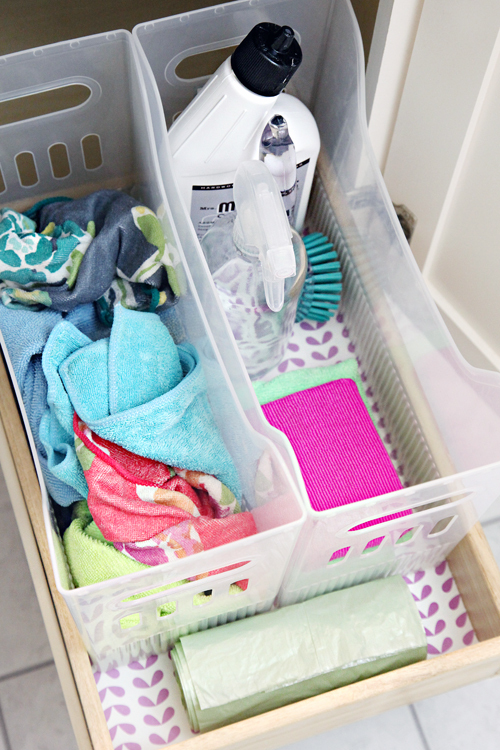 I can't get enough of these Multi-Purpose bins, they are inexpensive, easy to clean, light weight, narrow and can function for endless organizing tasks. 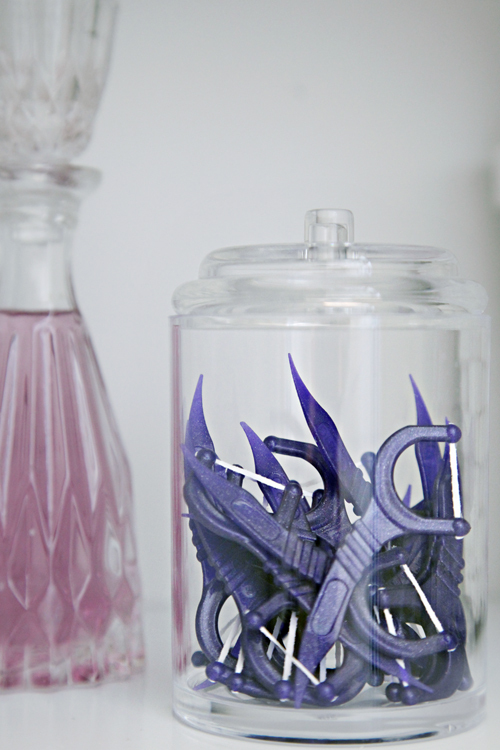 In the past I tried to do stacking bins for cleaning supplies, but these just work so much better for daily use. One bin for cleaning products and one for dirty rags. The other drawer holds the toiletry items that I don't use each day, but didn't want to purge because they still get used on a weekly or as-needed basis. On the opposite side of the room, we removed the hand towel rack from the wall. It was just a clutter catcher and we are ultimately going to install a door to our closet, so we have to get use to the lack of wall storage anyway. As you can see above, the shower was also purged down and empty bottles were recycled. The small stool received a new coat of paint and works great for holding a towel and robe while showering. 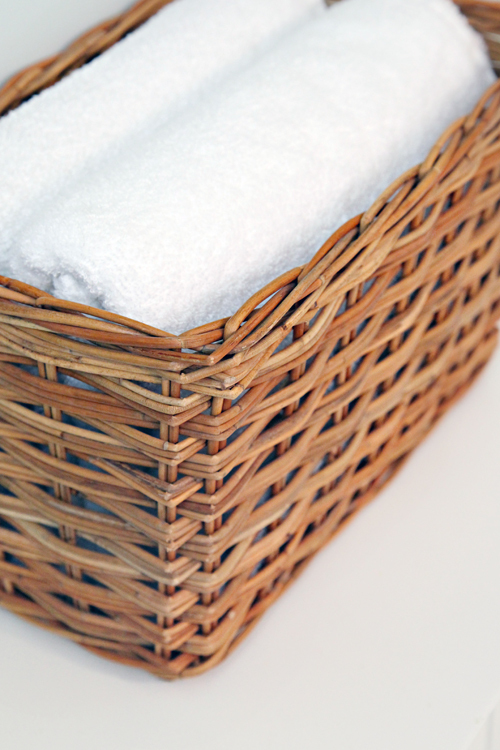 We only keep two towels per family member, so while two are being used, two clean ones are waiting in the basket on the hamper. And that completes the Master Bathroom tour! So fresh, clean and organized and such a dramatic difference from what we have been living with. 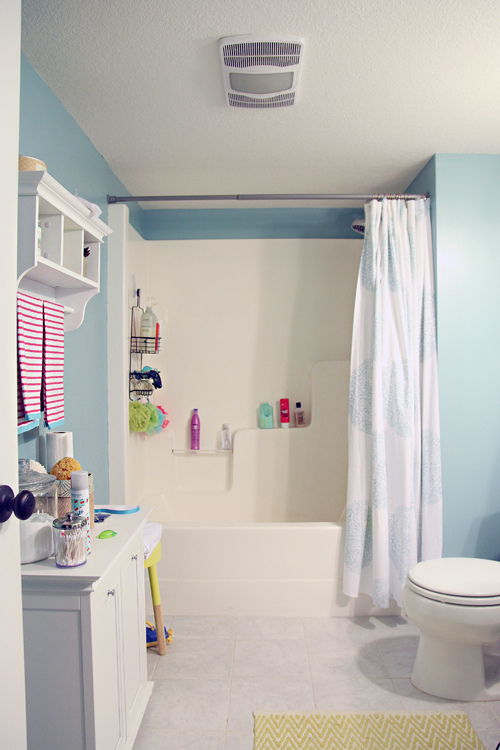 Even after taking my first shower in the space, I felt so much more relaxed than I had been previously. There is something to be said about the impact that visual clutter can have on your feelings. Between painting the walls, updating the grout, small DIY's, completely purging and reorganizing the space, I easily invested 12 hours into this project. However, I don't regret a single second of the time spent. To really celebrate this week's hard work, let's check out a few side-by-sides of the before and after pictures. Now! Who wants to win a $50 Gift Certificate to The Organizing Store!? 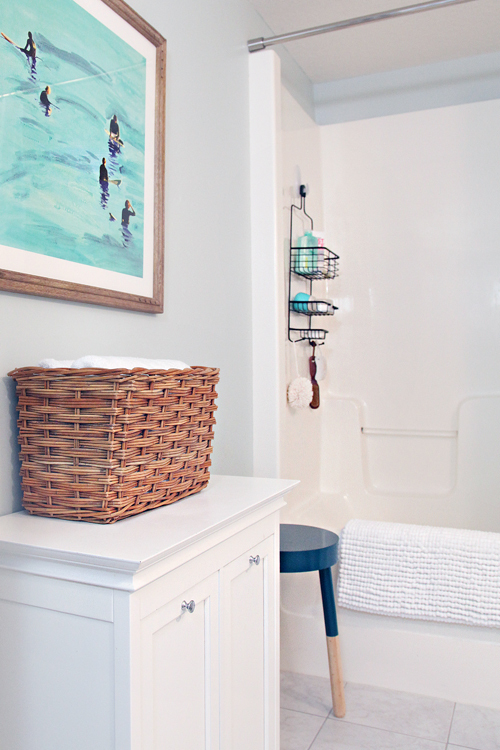 Whether I am DIY'ing my own organizer or purchasing something for a project, I love finding storage that is pretty and meshes with our home and decor. 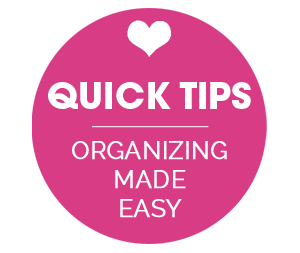 The Organizing Store is a prime "go-to" spot for the most beautiful, current, trendy and stunning organizing supplies around. Using random.org, one link party participant will be selected to win the gift card at the end of this week's challenge (no need to participate each week to win)! Time to share your Week 3 stories and projects with me! I really have been in awe of the projects you are sharing each week! And each party is receiving between 35,000-50,000+ views! Let's keep the organizing momentum going this week! UPDATE! Congratulations to this week's winner! 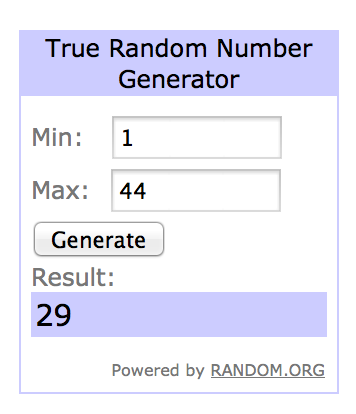 #29 has been selected by Random.org as the winning participant of Week Three! 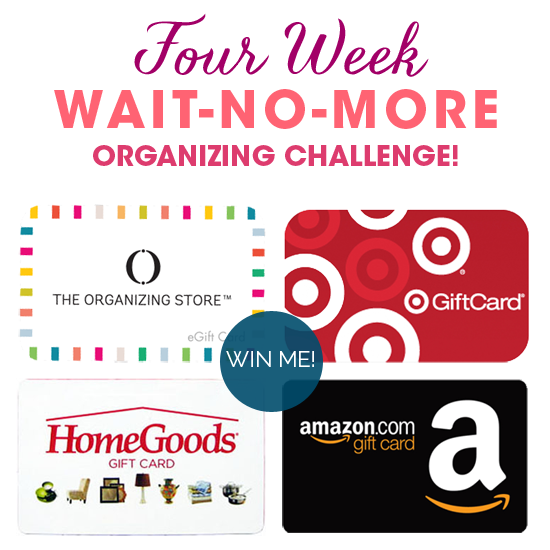 Keep an eye on your email, I will be contacting soon to coordinate your Organizing Store gift card winnings! Amazing! Where is the shelf liner from? Oh my word. The change is so huge to that room, and, really, it's mostly all about the paint! The color is sooo much nicer (I seriously love, love, love it.) Love all of your little changes and how large of an impact the little things have on the big picture. Thanks for sharing with us! It looks absolutely amazing! It's crazy the difference a few tweaks can make! Hope you're enjoying your new spa oasis! Hi, I just love your paint&re-organize make overs. My firstborn starts school this fall and I'm planning to do similar paint&organize make over to our mudroom. I hope you and your family have a nice summer. So pretty! I LOVE the new wall color and everything looks so clean and fresh. You are so efficient! 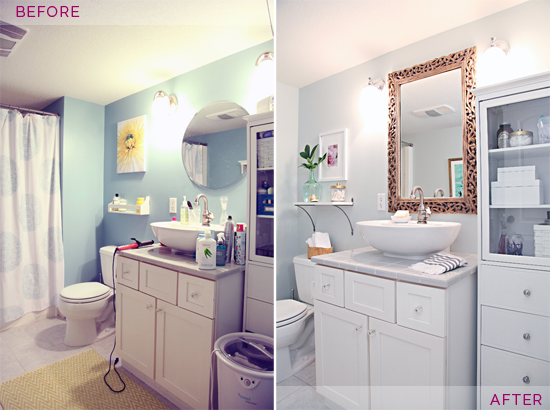 We did a similar mini remodel with our hall bathroom years ago and it took us three weeks. Great job! I love the new space! My favourite is the paint colour which really helps to brighten it up. And that mirror is stunning! Great job! Jen, where are those beautiful blue and white towels from? They are gorgeous!! Hi Lauren, They are from HomeGoods a few years ago now. xo! This is gorgeous!! 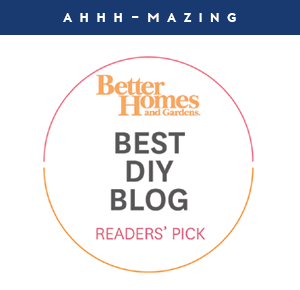 I'm about to do a massive master bath remodel - pinning for later!!! I just love the new color in the bathroom! And that mirror is perfect for the space. Beautiful! I'm glad to see the link-up again! I love seeing what everyone has gotten up to. As for myself, I just finished my own automobile spruce up with the help of your terrific Week 2 tips. I feel so good about that! Thanks for the inspiration! Hello, great refresh! I think that the vanity counter would look great with the same grout renew, to tie in the floors.You did a wonderful job. So pretty! Enjoy your new space. 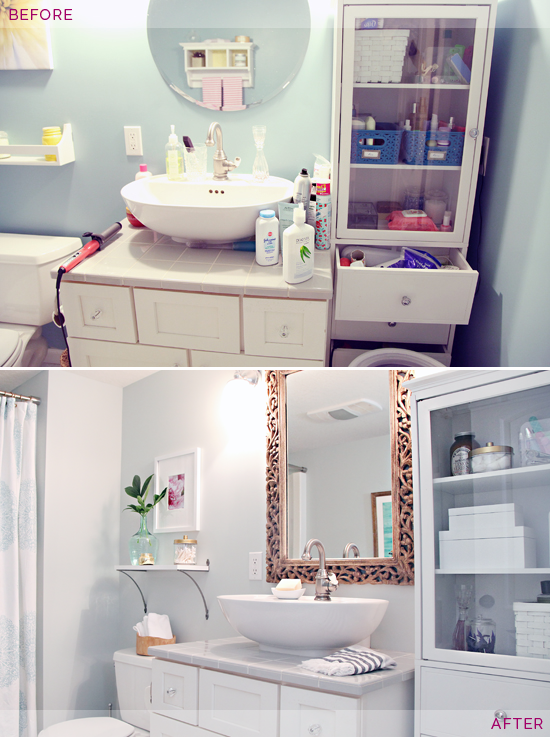 The bathroom looks so fresh and organized! I love how innovative you are... 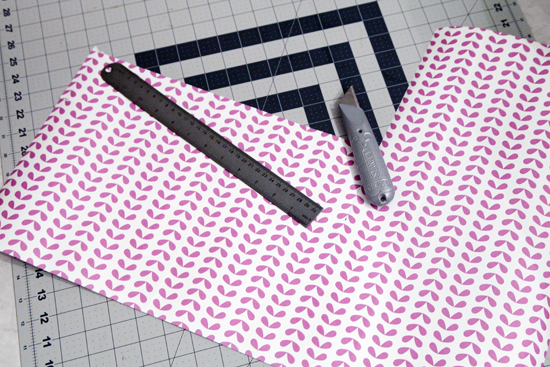 I like the idea of using cardstock to add dividers to the storage box... 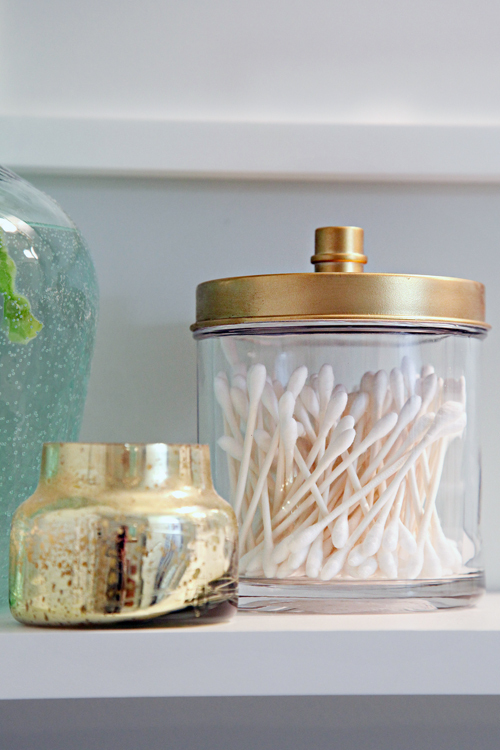 I always have bobby pins and hair ties that someone disappear and I also liked how you spray painted the lids on the glass containers to make they look more chic. 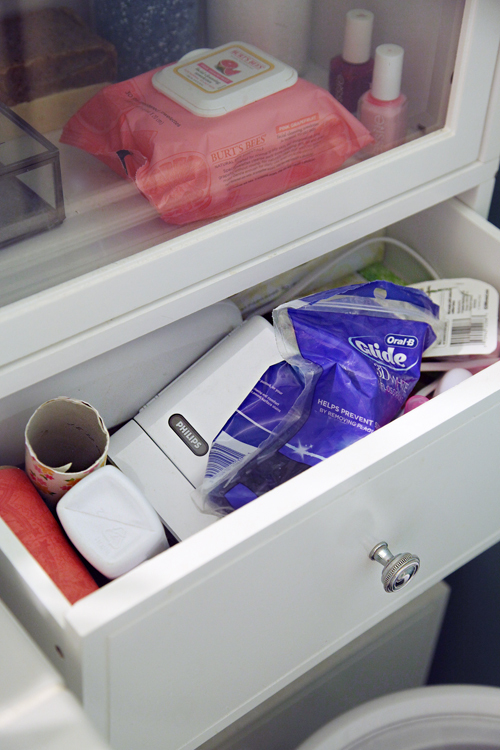 The pretty liners for the drawers seem to make all the difference too. Definitely gave me some great ideas! Thanks so much for sharing! 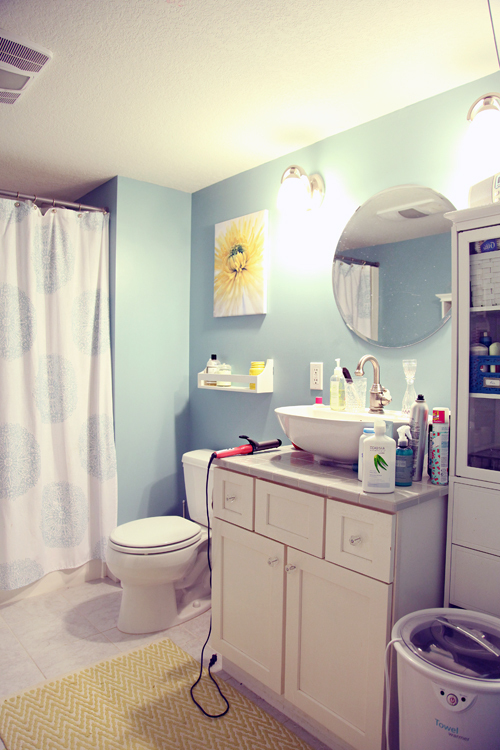 I really love how your bathroom looks now! I wish mine was that beautiful. Love how everything turned out! 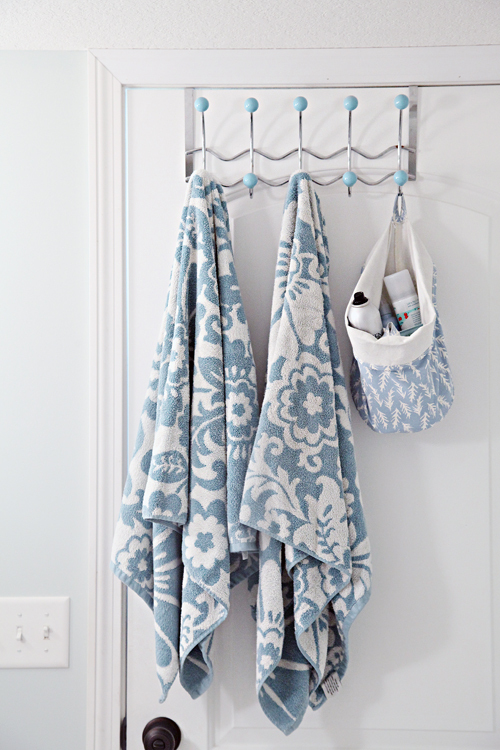 What did you end up doing with your towel warmer? For now I put it on a shelf in our storage room, I typically only used it during winter months anyway. When winter rolls around I will have to decide how I want to store it or if I am OK with it taking up bathroom floor space for a few months. That looks fantastic! Where did you find those white storage boxes? I have a whole lot of painting to do and I love your new wall color, too! Please tell me who makes it and the name! Pretty please! The new wall color is Sea Salt by Sherwin Williams. The new mirror is the best part for me! And how you tweaked the paint color to tone it down. I love color so I tend to go too harsh and I realize that subtle has more staying power. 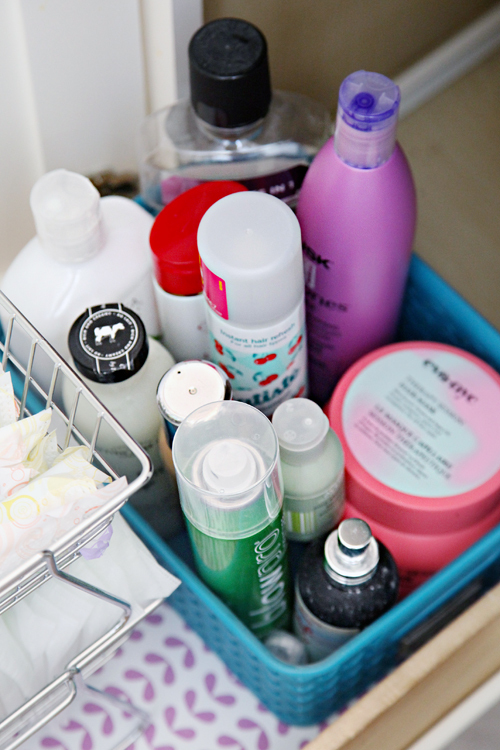 This makes me want to organize my bathroom now! Hi, Jennifer! I spy really cute microfiber (I think!) cloths underneath your cabinet. Where did you buy them? I have a few basic ones but haven't seen anything else that cute. But I also found a few colorful ones from Target a couple of years ago (watch during back-to-school season). Hi Jennifer, do you fill up the previous holes from the mirror in the wall and then drill new ones or do you use the same pre-drilled nails? I know its not the same but I am trying to install new cabinet hardware and trying to figure out if rescrewing at the same spot without filling the previous holes in is a good idea or not - thanks a bunch! I did fill and patch all previous holes from our wall hooks and the mirror. I find it is a pretty simple step to use some wall putty and sanding blocks to clean up the walls when painting. As far as cabinets, it is a bit more challenging to patch and get a clean look because you have to find a paint match and really be diligent about achieving a super smooth finish. When it comes to hardware, I tend to try and use previously drilled holes, and do not fill them before re-installing different hardware. thank you so much! that helps a lot! I love the end result. 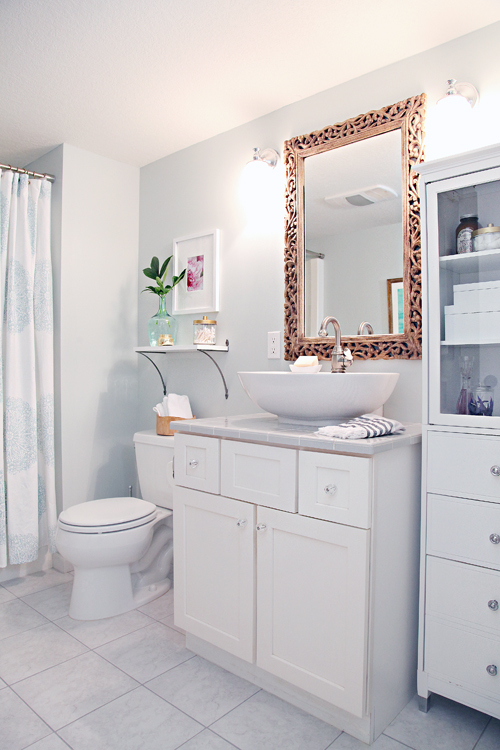 I need to address my bathroom, too, and yours is a great inspiration. I love it! Are you able to turn the door to open the other way on the cabinet? If so, that would make it a lot easier to use, and it might be a really quick job (depending on how it was made). I don't believe so but definitely worth looking into! Thanks for the suggestion! Jen, everything looks so beautiful and fresh! 👍 good job! Are you planning on adding a rug? What did you do to the grout? Sorry, I think I missed that. You went to target!? It's been a while, hasn't it? No rug yet, but eventually. Didn't want to rush purchasing something new for the sake of the post. By the way, I love all of your organizing challenges! It gets me moving too! Thank you! 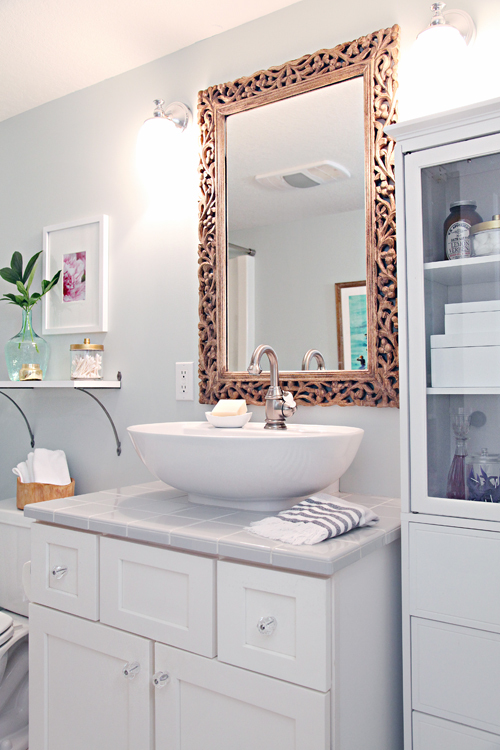 Lovely, as usual, Jen :) Quick question, what do you store in the small white cabinet that your towel basket sits on? Perhaps you could store your towel warmer there? Looks so beautiful! Where did you get the surfers painting? Love the colors in it! I love removing labels, like on your polish remover bottle, but am not always successful. How do you remove labels from various items? I have tried a few methods in the past, but what works best for me is to use a hair dryer to heat the label and peel it off first, and then use a little Goo Gone to remove the rest. Was super slick for this project! I have been using it for at least a year now, I didn't like the water dripping down into my toiletries and soaps, so I moved the caddy to the other end and have been loving it so much more. 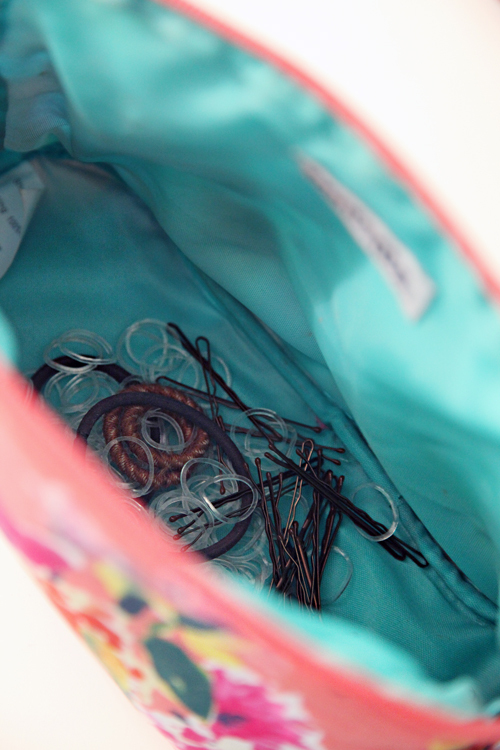 I wasn't sure how well the hook would hold, but clearly I have packed quite a few items on it and it has been great! So beautiful and clean! I love that. I was inspired by your nail polish organization and ordered a nice Lucite caddy from the Container Store to upgrade my current shoebox. Enjoy!! The new wall color really updates the space and makes it more grown up. Nicely done! Fabulous! Love it! So fresh and clean! I've been thinking of painting our dining room sea salt. Does it read gray or green to you? I completely love the color, but I think it is a lot like the color we ended up selecting for our kitchen/dining/living room (BM's Quiet Moments). It really depends on the time of day and light. 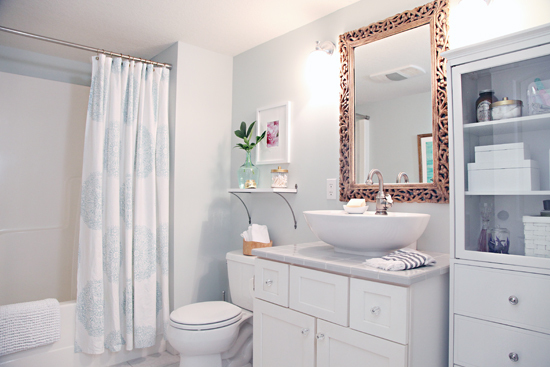 In the bathroom with no natural light, it is consistently a solid gray/green/blue combo. :) It is like the perfect mix of all three (though slightly more blue/green than gray). I would paint it on a couple of different walls and watch it over the course of a few days, because I believe Sea Salt is one of those trickier ones. xo! Thank you! That helps a ton! Did you use semi-gloss or satin? And what does the sherwin williams 'deep' and 'ultra deep' distinctions mean? 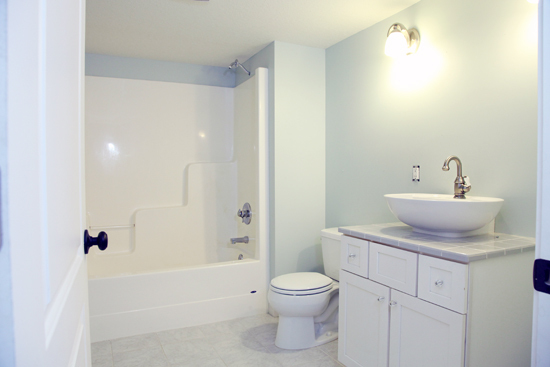 I am going to take on this bathroom paint job this week! Hi Steph! 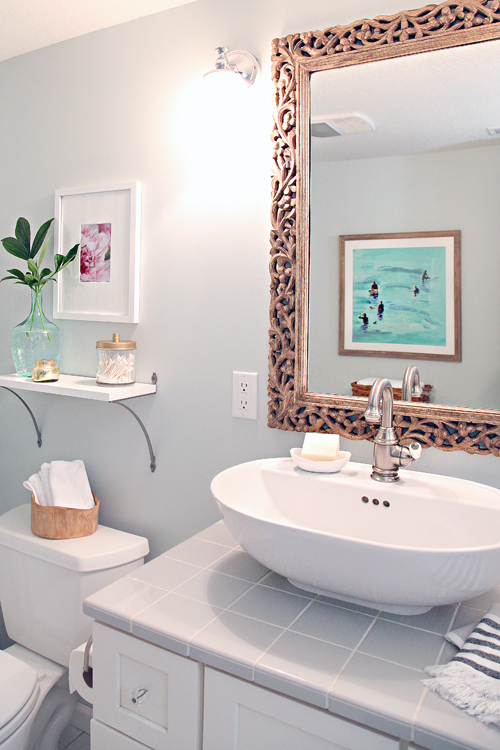 I used Satin, but Semi-Gloss is also a great option in bathroom spaces. And the "deep" vs "ultra deep" is most likely the paint's base. The paint expert will select the correct base when mixing a color for you at the store. xoxo! Hi - I just love your blog. I use it as inspiration for my own home...I'm not great at 'nesting,' but learning for the sake of creating a beautiful, functional home for my family. 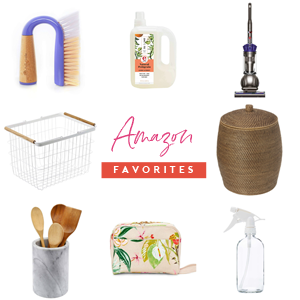 Wondering if you post lists of all your products? I couldn't find it on this post, but maybe I missed it? What size (container store) bins do you recommend for the kitchen, bathroom and other parts of the house in general- what sizes are the most versatile?